In the wake of last week’s collision between US and Russian satellites, research by scientists at the University of Southampton highlights the possible risks to other spacecraft in the Iridium constellation from the resulting space debris cloud. The Iridium satellite constellation is a system of active communication satellites, which allows worldwide voice and data communications using handheld satellite phones. The Southampton study, conducted in 2003, simulated the break up of an Iridium satellite resulting from a collision with a 1 kg projectile, and investigated the risk to the remaining Iridium satellites from the fragments produced by the original break up. Dr Graham Swinerd and Dr Hugh Lewis from the University’s School of Engineering Sciences, found that the position of the original break-up strongly influences the risk of new collisions. For a break up over the equator, the debris cloud is relatively dispersed over the poles so there is a greater chance of high-energy interactions with Iridium satellites in other orbital planes. 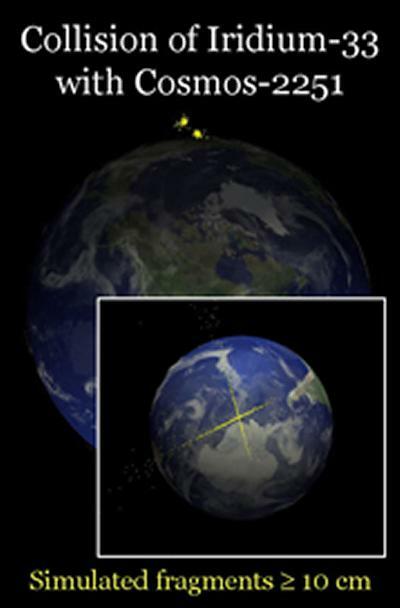 In contrast, for a break-up over the North pole, near to where Tuesday’s collision took place, the Iridium satellites in the same orbital plane as the debris cloud remain the ones most at risk, but the impact energies tend to be lower and less likely to cause another catastrophic break-up of a satellite in the constellation. Tuesday’s collision differs from the 2003 study in that is likely to have generated two separate clouds of fragmentation debris, as it involved two, relatively large satellites travelling in different directions. Consequently, higher impact energies are possible in spite of the near-polar location of the break up. Using the University-developed Space Debris Simulation (SDS) and DAMAGE debris models, researchers found that the chances of debris larger than 1 mm from the original collision impacting another satellite in the Iridium constellation was about 1 in 7,000 after 30 days, but the peak collision probabilities occur in the first few days after the original fragmentation and drop fairly rapidly after that. With the satellite company Iridium intending to replace the satellite with one of its in-orbit spares within the next 30 days, the Southampton researchers estimate that - based on their 2003 study results - this is probably outside the period where a 'secondary' collision may occur. The University’s School of Engineering Sciences (www.southampton.ac.uk/ses) has been supporting the British National Space Centre's role in the Inter-Agency Space Debris Coordination Committee (IADC), an inter-governmental forum for the technical discussion of space debris, for several years. The IADC will be holding its annual meeting in March 2009 at ESA's European Space Operations Centre (ESOC) in Darmstadt, Germany. View a computer simulation of the Iridium collision. Results from the Southampton study were published in two articles: Acta Astronautica, Vol. 54, 2003, and in the proceedings of the International Astronautical Congress held in Bremen in 2003 (paper no. IAC-03-IAA.5.2.10).